The location was perfect. Our stay was amazing, our family enjoyed our stay very much. I would like to specially thank Mr Islam at front desk for making us very welcome. Would definitely come back again! All staff, and specifically the front desk staff and hotel manager were very helpful! They took care of all our requirements! Had a great stay and will be happy to visit again. We stayed in an Al Bahr chalet which has a BBQ pit and walking distance to the main hotel and other facilities. The room was clean as was the beach. The water was clear and the sand fine. We had an enjoyable time building sandcastles and swimming in the sea. The pool was nice as well but we couldn’t use the family pool as the heater was broken. The buffet breakfast was good and there were many choices of food. Customer service was amazing. Miss Suhaila did a wonderful job of making sure we were comfortable throughout our stay. We encountered a few snags but they were taken care of swiftly and efficiently. everything was nice, I liked the little change/ upgrade on the beach side. especially know camping season, the resort is very near to the camping life and sun-dunes. The location and the layout of the place. It has a great atmosphere to enjoy with your friends. Perfect position to the beach. Nice views from every room. 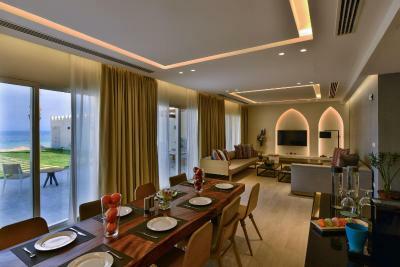 Sealine Beach, a Murwab Resort This rating is a reflection of how the property compares to the industry standard when it comes to price, facilities and services available. It's based on a self-evaluation by the property. Use this rating to help choose your stay! 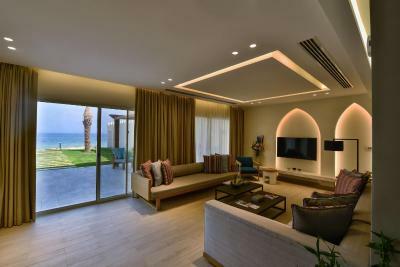 Sealine Beach, a Murwab Resort offers Executive rooms and suites, 2-bedroom chalets, 3 and 4-bedroom villas with private pools, the property extends on a 9,850 feet pristine beach with stunning sea view from all units. 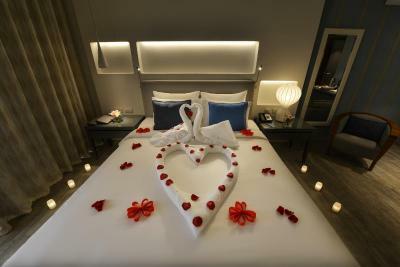 Come relax in the resort`s comfortable beds and well fitted bathrooms with high-end amenities including toiletries, fluffy towels, bathrobes and slippers. A flat-screen TV is available in all units including local and foreign TV channels. Guests can also enjoy an a la carte meal at one of the restaurants or a refreshing drink at the bar. Featuring free WiFi, the resort features two outdoor pools and one kids pool. The resort has a kids playground, a fitness center, a spa and a tennis court. Take part of many of the on-site activities such as camel & horse riding and jet skiing. 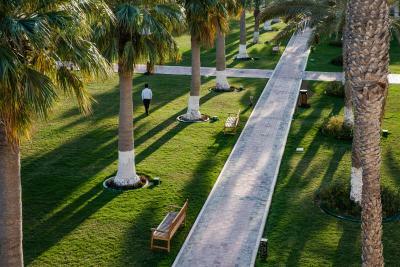 Just 40 min from Doha city and 30 min from Doha International Hamad Airport, Sealine Beach Resort is the place to be for visitors seeking a memorable experience. This property also has one of the top-rated locations in Mesaieed! Guests are happier about it compared to other properties in the area. This property is also rated for the best value in Mesaieed! Guests are getting more for their money when compared to other properties in this city. 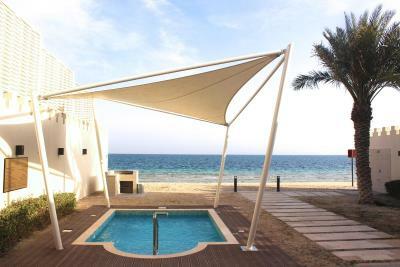 When would you like to stay at Sealine Beach, a Murwab Resort? A standard room 36 sq yards each, with a king-size bed with an attached bathroom. Some of the rooms are located on the ground floor with a small patio and the others are located on the first floor with a balcony. 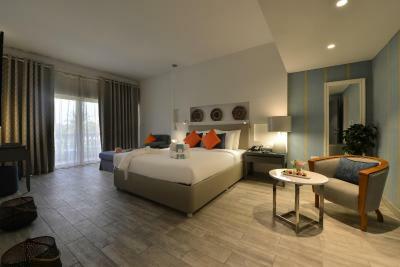 All rooms overlook the magnificent beach, gardens and swimming pools. 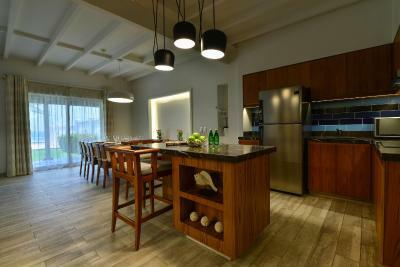 77 sqm each, the Two-Bedroom Chalet offers sea view with two bedrooms – one master and one twin bed, living room and kitchenette. Small patio with BBQ station perfect for small family and group getaway. 187 sq. yards each, sea view with three bedrooms – one master and two twin beds, living room and kitchen with full cooking facility, with spacious patio and direct access to the beach. Please note that 3 Cars only are allowed per Villa. 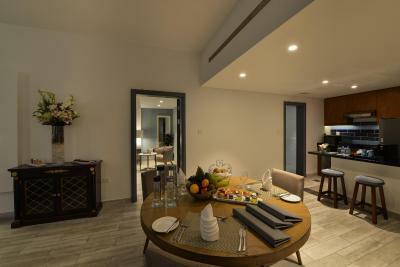 The 278 sqm Executive 4 bedroom villa offers three bedrooms and one service room, fully equipped kitchen, spacious living area and four bathrooms. All units have a garden patio with direct access to the beach and a lake view. This 514 sqm Royal Villa comes with three bedrooms and one service room, fully equipped kitchen, spacious living area and four bathrooms. All units have a garden patio with direct access to the beach, lake view and a private swimming pool. 88 sq. yards each, with separate receiving area, kitchenette and guest bathroom. Perfect for honeymooners or a small family on vacation. A standard room 36 sq yards each, with twin-size bed with an attached bathroom. Some of the rooms are located on the ground floor with a small patio and the others are located on the first floor with a balcony. 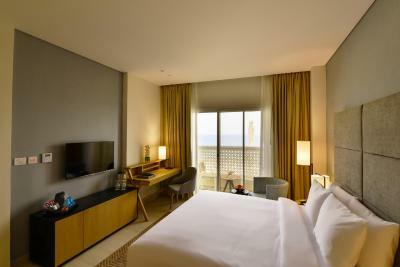 All rooms overlook the magnificent beach, gardens and swimming pools. The 912 ft² executive four-bedroom villa offers three bedrooms and one service room, a fully equipped kitchen, spacious living area and four bathrooms. All villas have a garden patio with direct access to the beach and a lake view with plunge pool. 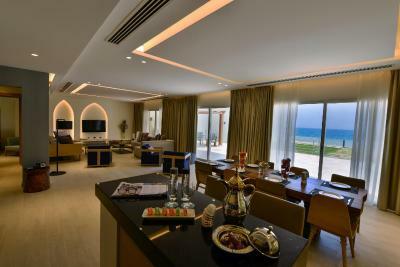 House Rules Sealine Beach, a Murwab Resort takes special requests – add in the next step! 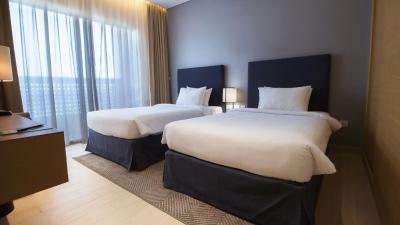 All children under 12 years are charged QAR 150 per night for extra beds. Sealine Beach, a Murwab Resort accepts these cards and reserves the right to temporarily hold an amount prior to arrival. 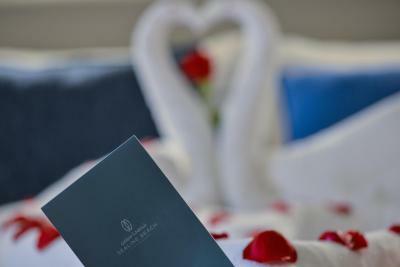 Please note that Sealine Beach Resort does not accept bookings from non-married couples. All couples must present a valid marriage certificate upon check-in. Please note that this is a family resort only. The property reserves the right to refuse bookings for single guests. Please inform Sealine Beach, a Murwab Resort of your expected arrival time in advance. You can use the Special Requests box when booking, or contact the property directly using the contact details in your confirmation. The service was bad. Had to wait 5 minutes for room service to pick up the phone. House keeping never answered the phone. Food quality was not up to the standard. Croissants at the breakfast buffet were good even though the spread wasnt much. the staff was very friendly and helpful, but the level of english of some staff was not sufficient to answer some questions. A map of the resort would be helpful but there was none available. Very nice pool, gardens and beach. There is a children's playground which is gated. Great breakfast buffet with large variety, with freshly prepared eggs. Very friendly staff. 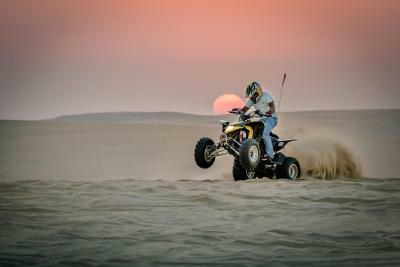 Great location next to the dunes if one is interested in activities such as desert trips or dune bashing. Restaurent menu is little expensive with limited options. Nice ambiance and Gr8 place for Kids. its an excellent resort to spend a weekend. 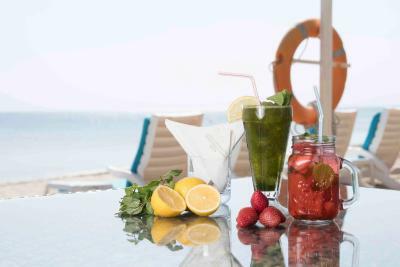 Sealine beach hotel is a great place for weekend. I didn't like the dinner buffet.... it was substandard and not much choices. The bathroom drainage in our suite was smelly and there was a stench especially during the night. The bathroom with a very bad smell and the water Come out from the sink and from floor and the bed mattress very hard, bad, old not comfortable at all. Breakfast option was very limited. Also housekeeping were not that prompt maybe because of the rush hour. But still it's not an excuse. Location is beautiful, scenic, calm and blissful. Best part was that we could take our vehicle to chalet, i must say it was very convenient, well thought!!! We really liked the hospitality of the staff and the resort to make our stay extra special. We even were surprised on the first day the minibar and welcome sweets was provided complimentary which made it feeling special during the season of Christmas.